Oracle Management Cloud is a new Oracle Cloud offering launched during Oracle Open World 2015, of which I am very very interested in. Currently you only can get a paid subscription (no free trail available yet) so the following here is to give you an overview of what it is, based on different sources from the internet and some Oracle Sales material. Strangely enough, I think, if I see for example the view count on the available YouTube movies, it hasn’t got that much traction yet. So why am I so enthusiastic about this particular Cloud offering? To clarify some of the pointers. When I started at my first IT job, I had to manage distributed Oracle 7 environments on Windows NT 3.0 (I am not kidding you) between Rotterdam (The Netherlands) and the Ipswich (UK). In the client-server topology of that time, it means that I had a bag of tricks to, via Windows SDK and other tooling, to remotely manage (e.g. start or stop) database instances, Windows services, etc., in the UK; hundreds of DBA SQL scripts, and other solutions that helped me do stuff (all from the command line), Don’t forget, at that time (20 something years ago), Windows NT 3.0 wasn’t much more than a glorified Windows 3.11 machine. Later on, working for a different employer, I remotely managed (on my own) several business critical, some simple, database instances. So I almost immediately embraced Oracle Enterprise Manager 10g when it came out (10-15 years ago? ), and traded my bag of tricks, small own build web based SQL framework (HTMLDB/XML SDK Servlet) for this new OEM web based solution. I had now a centralized view of all my environments that I had to manage and more. Somewhere in my very old email folders, I have a picture that I created for my manager at that time, that displayed a remotely managed topology / environments overview, which could be easy to setup with a CD at hand that contained OEM agent software. Installing the agent software on site, via this software CD, enabled connecting the database and other Oracle environments, up with our central “OEM hub”. Its funny when I think about it, because I still can remember a emotional debate with an EMEA Oracle person at that time, trying to convince him that OEM could be used for more then local database management on premise (how we call it today). Even if you are knowledgeable in (remote) Oracle database management and have a tool like OEM at hand, it doesn’t give you the ability yet to “connect the dots” if something goes wrong, like performance problems. You must be willing to acquire knowledge about the stuff on the other side of the fence as well. If you do, you will be more valuable and effective for your business. You will have the ability to function as a bridge between multiple disciplines (management/developers/database management/hardware, network guys). In all its an enriching experience and, for example, it makes you a better database guy (or DevOps+ guy to follow the buzz a bit). A while ago, during a job interview, a younger person (seem from my perspective – and who is not nowadays 😉 ), asked me if I could tell him where all the specific Oracle RAC log files where. My first response was, but I didn’t (job interview and all), if he knew where all the WebLogic / Oracle Application Server logging where situated. That said, its almost impossible nowadays to know where all the key log, trace, alert files are which one should examine to be able to see the context of it all, that is, all factors that contribute nowadays in a modern environment (lets keep it simple…): client machine, client software, middle tier (hardware/software/versions/patch info/operating system/oracle network/connection pooling/clusters), network connections, in between infrastructure like switches, routers, DNS/name servers, security implementations, load balancing hardware, failover architectures, database (software/operating system/patches/hardware), SAN/NAS hardware, SAN/NAS vendor specific I/O solutions, connection setup to the SAN/NAS environments/etc., etc., etc. And we are not even talking yet about end user behavior (“Do you know that the software was not build for that purpose?”, “That’s the wrong button b.t.w. ?”, “You shouldn’t quit the browser based application by using the [x] – this will create a lock in the database”), IT knowledge level of everyone involved on all the different levels (“You have forgotten to setup this bit with parameter x”, “The patching off the database caused that middle tier SQL*Net connection to fail – incompatible security connect methods”, “Altering the OEM server node name, caused failures across the board regarding SSL connections”), etc. Lets say you encounter someone on the street, a person you know, and she or he is sweating a lot. Do you think he might be sick or do you ask him how much miles he has run just now? Think about it. Both might be true, although probably not at the same time (link: some causes that make you sweat). The ability to assess the situation correctly is all about context and the knowledge you have. Interpreting all the info available correctly is hard, really hard, and still a mayor problem/risk for your business driven environments to correlate cause and effect correctly within the context it occurred. 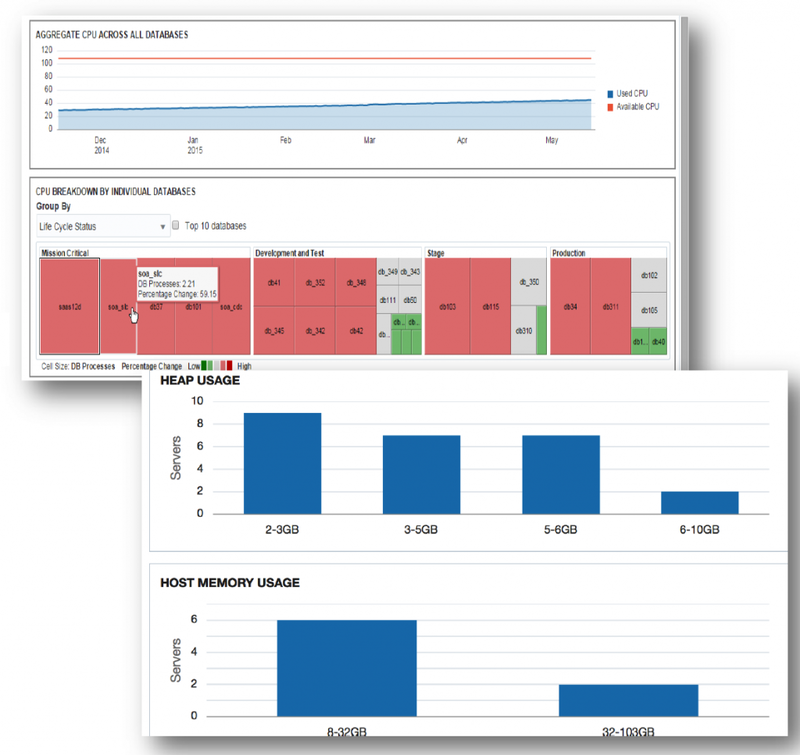 Oracle IT Analytics Cloud Service allows you to step back and assess macro issues. It enables you to also evaluate systemic problems impacting application performance and use event analytics to fix faulty or misconfigured components. Via a software agent package (and enhanced OEM agent or even separate agent product? 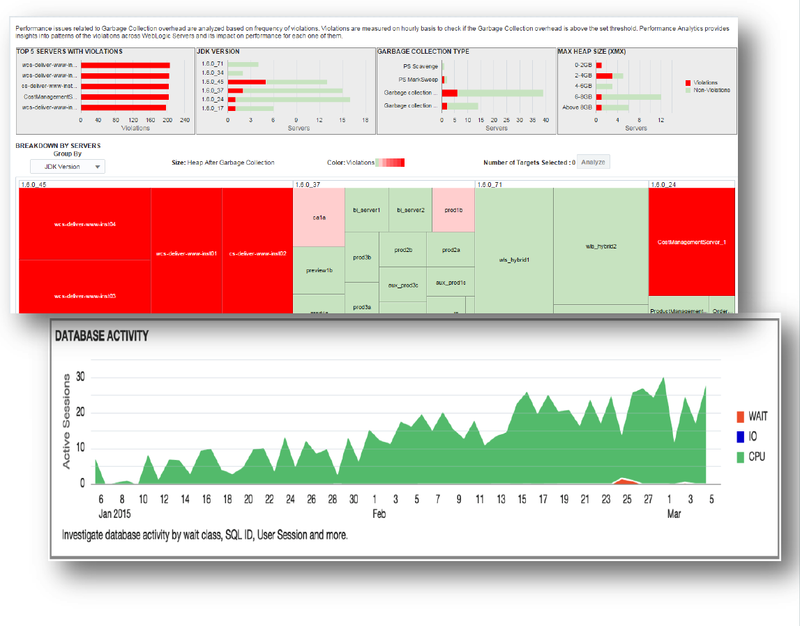 ), you connect your environments to the “Oracle Management Cloud” environment. This will enable the Management Cloud to get hold of all the trace, log, alert, etc. files it can consume out-of-the-box formats. You have the ability to consume even more formats via creating your own “parsers” based on regular expressions. At current Oracle supports 50 or so different formats (and will create more in the future). All these files, all this info, end up in one unified big data environment. The video mentioned in the documentation gives you a feel of what it could do for you. It doesn’t give you the overall solution(s) yet when dealing with (performance) problems yet if you don’t have the knowledge to interpret what is in front of your eyes, nor the correlation ability. You still need the knowledge to correlate, for example, which database is having what kind of impact on which application server (and/or vise versa), but it will provide you with a lot of information in one place without having to actually connect to all the environments, figure out where the (trace/log/etc) data is. Have a look at the following YouTube movie and decide for yourself if it would be “a nice to have” service. Be aware that all those (Oracle OpenWorld 2015 based?) YouTube movies start with the general Oracle disclaimer, so without a (test) trail account I can’t verify what is, what will be there currently in the Oracle Management Cloud. I really liked the dashboard as seen [here], but have no clue, because it shows application, host, storage, database and network components, with which service / tool, this dashboard can be created. Maybe its part of something else or a main “Management Cloud create dashboard” section. The current available documentation is a bit sparse when it comes, for example, creating dashboards or other functionality. Can I create or access REST or other API functionality to embed into a DevOps architecture to signal, for example, “deployment didn’t succeed (disk full)”? How long can one keep the data, due to SOX regulations and/or can I can get the correlated info out to my system (security analysis purposes)? Anyhow. I like the offering and of course it is only launched a short while ago, so take that into account as well. Just like a tool like Oracle Enterprise Manager, its is as good as the guy who is using it, but will pinpoint you probably more easily at the issues at hand, give insight in old and predict a bit of what might be happening in the future. Have a look at it and I really hope it will get more traction (and a test trail possibility) then currently is shown per view rate on those YouTube movies (a few hundred at best). If you look up “Oracle Management Cloud” be careful not to end up on “Oracle Managed Cloud Services” offerings or “Order Management Cloud Services” page information, which are completely different service/product offerings compared to “Oracle Management Cloud”. Whats in a name, right…? Oracle Cloud – Stairway to Heaven…? Next Post OGh DBA Day – Call for Papers!